Locked down the cover art for Soul’s Blood today. It’s exactly what I wanted it to be. 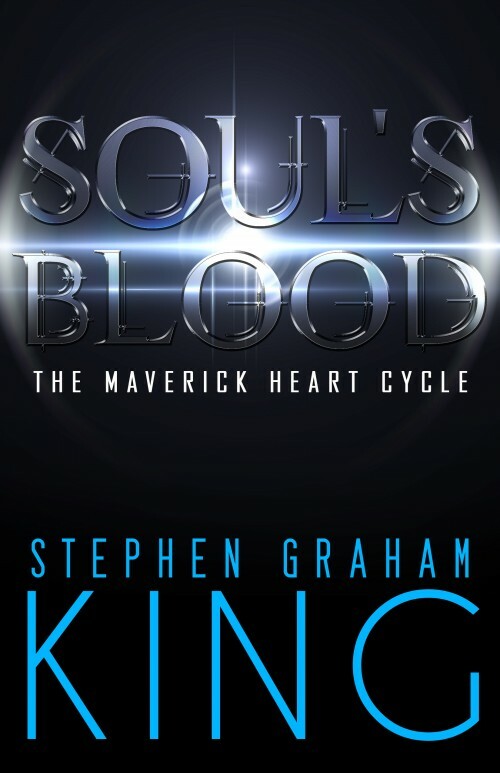 As promised, here’s a PDF of the revised first chapter of Soul’s Blood. Please share any thoughts you might have when reading it over. Finished reviewing the proof on Saturday night. And let me tell you, if there was any chance of my falling prey to hubris, reviewing that proof killed it. When I need to do a really hard edit, really see the flaws, I edit backwards. Someone taught me the trick a long time ago and I find it invaluable. I start with the last page, read it and look for typos, extra words, missing words, repeated words, or any other artifacts of revision that may have slipped by. It’s one of those tricks of the mind. When you read it in the right direction, it’s too easy to get caught up in the flow of the story, how it’s unfolding. When you remove yourself from the plot, you see only the construction of the sentences, the actual physical way the words fit together and you see that page in isolation. It makes it so much easier to spot the errors. And there were a fair number. Well, I left around 72 notes in the pdf, which isn’t really that many in a book that’s almost 300 pages. But some of them would have been really embarrassing if they had slipped through. There were some formatting errors too. But, knock wood, the worst have been fixed. I worked through most of Friday evening and a good chunk of Saturday and sent it back to my publisher. And last, but definitely not least, the venue confirmed for the launch party. If you’re in T.O and I haven’t reached you through Facebook, hit me with an email and I’ll get you the details. So, the pdf proof of Chasing Cold arrived in my email today. It’s the interior of the book, formatted the way it will actually appear between the covers. I called it galleys on Facebook. Mostly because I love the word, even though it’s obsolete now that no one typesets any more. It has a romantic tinge to it, something classic. I picture someone opening a box or envelope and pulling out pages to read, like in Auntie Mame. It’s one of those silly little author fantasies, the things you can’t wait to have happen when it’s finally your turn. Your words are one step closer to being a book. Because, one thing they never really tell you, a manuscript doesn’t look like a book. It’s larger and double spaced and is just a stack of pieces of paper. It’s more like a really, really long high school essay or something like that. It doesn’t feel like a book at all. But, when you see it in the right page size, with all the words neatly close together and with the proper indentations and all the italics where they’re supposed to be and the title page and your name on the top of the pages on one side and the title on the top of the pages on the other side, you see it grow. You see it become. That was what I did today. I saw it become. Not all the way, but that much closer. And I found two typos so far and an indentation error. But that’s what proofs are for. Soon my baby will be out there in the world, in her shiny new jacket. All on her own, facing the lovers and the bullies. I wonder what people will think. Will they get the story? Will they see something of themselves in it? Will it become someone’s treasure? Someone else’s treasure, I guess. One step closer to knowing. I’m not good at waiting. I never have been. Publisher is launching Chasing Cold at the beginning of April. We’re in the home stretch. Received and reviewed the edits. He’s working on the pdf galleys. I’m working at securing the venue I want for the launch party. Once we have the pdf or ARCs, we’ll query the two authors we’re seeking cover quotes from. We have some press and reviews lined up and ready to go once we have copies. I’m on the precipice. There’s this huge change coming, this wave of new and different things. And all I can do is wait. Things take time. Any worth having is worth waiting for. I keep checking my email. It’s one of those times when having a Gmail app on my phone is not good for my low level OCD tendencies. Not really working on Blind Luck either. Wrote about 50 words tonight which is just kind of embarrassing. I know what I need to do: fix the spot where I ended up writing a half chapter that is totally the opposite of my original conception of that section. I need to amp up the drama and kick the chapter into high gear. I see the scenes and the visuals. The words, they no come. Oh, well. Shove it all into the back closet and let the subconscious pick at it a while. Had my writing group and managed to get a nice little chunk of writing done. About 1500 words on Blind Luck, the novel I’m working on. Bringing me well over 15,000. This next chunk is the end of Act One, the introduction to the world and characters and the incident that sets the rest of the plot into motion. Had a couple of brainstorms just as I was heading to bed last night. Always the way, it seems. When I need to be turning my brain off is when the flashes of insight and creativity come to me. But I’ve managed to get better at really storing them so I can act on them. And these were a couple of good ones that solved a couple of problems. Opened the doors to the rest of the act. Now, I just need to work out the details of the plot I have outlined.